Roe, M. A., Martinez, J. E., Mumford, J. A., Taylor, W. P., Cirino, P. T., Fletcher, J. M., . . . Church, J. A. (2018). Control engagement during sentence and inhibition fMRI tasks in children with reading difficulties. Cerebral Cortex, 28(10), 3697–3710. Research at the intersection of reading and neuroscience typically focuses on brain regions where neural activity differs between children with and without reading difficulties. Relative to children who are average readers, children with poor reading ability have less neural activation during sentence reading in regions along two “reading pathways” in the brain. These pathways are more often on the left side of the brain, start at the back of the brain where vision is processed, and send information forward toward brain tissue near the left eye (dorsal/higher pathway) and tissue below the left ear (ventral/lower pathway). Some of the regions along these routes that exhibit reading-related differences in activation are also active during cognitively demanding tasks other than reading. For example, the inferior parietal cortex is also active during tasks that tap executive control (McKenna, Rushe, & Woodcock, 2017). Executive control refers to a set of mental tools, or cognitive abilities, that help regulate our thinking and self-control to achieve and manage goal-oriented tasks, including reading. Executive control can also go by other names, like “self-regulation” or “executive functions.” Some of these mental tools include working memory and inhibition. For example, for students to pay attention and stay on task during class, they need to ignore distractions (inhibition) and remember instructions (working memory). Roe and colleagues (2018) were interested in the role of executive control in reading among children who have difficulty with reading comprehension and word reading fluency (referred to here as struggling readers). Previous research has demonstrated that struggling readers show behavioral impairments in executive control abilities such as planning, inhibition (intentionally stopping a learned response), and working memory (holding information in mind; Arrington, Kulesz, Francis, Fletcher, & Barnes, 2014). Supporting such behavioral findings is evidence for activation differences between struggling and nonstruggling readers in executive control regions during reading (e.g., the inferior parietal cortex; Meyler, Keller, Cherkassky, Gabrieli, & Just, 2008). However, it is not well understood whether struggling readers show altered brain activity during executive control tasks that do not involve reading. A widespread difference in executive control activation in struggling readers would inform options for reading skill instruction and would identify potential intervention targets that may include improving executive control abilities. If this difference is seen across tasks (is widespread), interventions might include activities to improve executive control abilities more generally (e.g., a task to improve working memory skills) along with reading activities. However, if differences in executive control activation are specific to reading, it may be best to use intervention activities that combine reading and executive control, targeting the ability to leverage executive control skills within the context of reading. To assess the role of executive control in reading for struggling readers, Roe and colleagues (2018) analyzed brain activity while struggling and nonstruggling readers in third through fifth grades (ages 8 to 11) completed a sentence reading task and an executive control task inside an MRI machine. The sentence reading task required participants to decide whether a short sentence made sense and to respond by pressing buttons on a controller. The executive control task (called “stop signal”) measured participants’ inhibition and did not involve reading. During this task, children were asked to press buttons to show which way an arrow pointed but also to withhold a response when a red X appeared on top of the arrow. Roe and colleagues analyzed brain activity during these two tasks prior to a school-based reading intervention conducted by the Texas Center for Learning Disabilities (Vaughn, Solis, Miciak, Taylor, & Fletcher, 2016). Reading groups were determined based on cutoff scores from a sentence comprehension test (the Passage Comprehension subtest of the Woodcock-Johnson III) and a word reading fluency test (Test of Word Reading Efficiency Sight Word Efficiency subtest) or a combined comprehension and word reading fluency test (Test of Sentence Reading Efficiency and Comprehension). Students who scored below the cutoffs were deemed struggling readers, and students who scored above the cutoffs were deemed nonstruggling readers. This study included 74 struggling readers (32 female, 42 male; average age of 10.14 years) and 34 nonstruggling readers (16 female, 18 male; average age of 9.93 years). Struggling readers showed control differences during a sentence reading task. Roe and colleagues (2018) used two approaches to investigate the role of executive control in reading. One approach compared activation in executive control brain regions between struggling and nonstruggling reader groups. A second approach correlated brain activity during each of the tasks with reading measures completed outside the MRI (the Woodcock-Johnson III Passage Comprehension subtest and the Test of Word Reading Efficiency Sight Word Efficiency subtest). Both approaches looked at activation across the whole brain and within executive control brain regions identified by other fMRI studies of control. Though the authors did not find group differences in executive control regions (approach 1) during the sentence task, they did find relations between reading ability and activation in these regions when combining across the struggling and nonstruggling reader groups (approach 2). 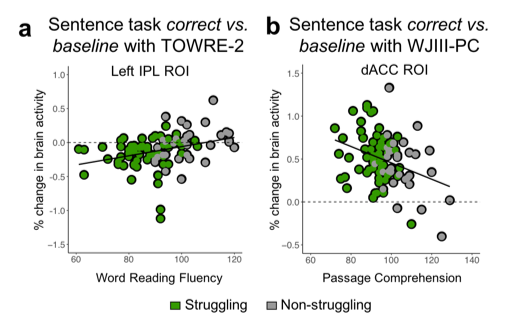 Better word reading fluency, meaning quicker and more accurate word reading, was related to greater activity in the left parietal control region (see Figure a). Better passage comprehension related to less activation in a midline control region (dorsal anterior cingulate; see Figure b). The authors suggest that these findings indicate that engagement of executive control regions differed by reading ability during correct performance on the sentence task. Struggling readers did not differ in control regions during a nonreading task. Testing the hypothesis of widespread differences in control engagement in struggling readers, the authors predicted that struggling readers would have different brain activity relative to nonstruggling readers in executive control regions across both tasks. However, the authors found no activation differences between the struggling and nonstruggling reader groups or relations to reading ability in executive control regions during the inhibition task. The inhibition task elicited strong activation within the expected control regions, but there were no group differences in activity, nor relations to reading performance. Roe and colleagues (2018) interpreted this result as evidence that difficulties in executive control in struggling readers may be limited to the reading process. One limitation of this paper was the use of only one nonreading executive control task. Results suggest that brain activation during the inhibition task was not different in struggling readers from that in their nonstruggling peers but that another aspect of general executive control (i.e., memory, switching/multitasking) could be. Further, educational outcomes like reading comprehension are often affected by socioeconomic status, but the authors were unable to characterize socioeconomic status for the children in the study due to incomplete collection of these data. The purpose of Roe and colleagues’ paper was to test whether struggling readers in third through fifth grades demonstrate an overall difference in brain activation related to executive control. By examining activation differences between struggling and nonstruggling readers during a nonreading control task and a sentence comprehension task, the authors found evidence for a set of executive control differences that were specific to reading. Future research should test struggling readers on other tasks that engage executive control regions. This research would provide additional tests of the hypothesis that struggling readers' differences in neural engagement are specific to reading tasks. Further, future research should investigate changes in control-related activation over time in struggling readers to understand how this process may change throughout development as children continue to hone their reading skills. Arrington, C. N., Kulesz, P. A., Francis, D. J., Fletcher, J. M., & Barnes, M. A. (2014). The contribution of attentional control and working memory to reading comprehension and decoding. Scientific Studies of Reading, 18(5), 325–346. McKenna, R., Rushe, T., & Woodcock, K. A. (2017). Informing the structure of executive function in children: A meta-analysis of functional neuroimaging data. Frontiers in Human Neuroscience, 11(154), 1–17. Meyler, A., Keller, T. A., Cherkassky, V. L., Gabrieli, J. D., & Just, M. A. (2008). Modifying the brain activation of poor readers during sentence comprehension with extended remedial instruction: A longitudinal study of neuroplasticity. Neuropsychologia, 46, 2580–2592. Vaughn, S., Solis, M., Miciak, J., Taylor, W. P., & Fletcher, J. M. (2016). Effects from a randomized control trial comparing researcher and school-implemented treatments with fourth graders with significant reading difficulties. Journal of Research on Educational Effectiveness, 9, 23–44.